Establishing the decision-making circuits and networks that give rise to individual behavior has been a central goal of neuroscience. However, the analogous problem of determining the structure of the communication network among organisms that gives rise to coordinated collective behavior, such as is exhibited by schooling fish and flocking birds, has remained almost entirely neglected. In a recent paper from Iain Couzin’s lab, “Revealing the hidden networks of interaction in mobile animal groups allows prediction of complex behavioral contagion”, published in The Proceedings of the National Academy of Sciences USA, the social communication networks in large, mobile animal groups were visualized for the first time. By developing computational tracking, body posture estimation and visual field reconstruction for all individuals, combined with statistical and machine learning analysis, it was possible to establish how the complex social scene is translated into behavioral response at the level of individuals, and to reveal the resulting “hidden” complex communication network via which behavioral change spreads rapidly through groups. By studying these interaction networks, the authors revealed the (complex, fractional) nature of social contagion and established that individuals with relatively few, but strongly connected, neighbors are both most socially influential and most susceptible to social influence. Furthermore, this work demonstrated that it is possible, using this approach, to predict complex cascades of behavioral change at their moment of initiation, before they actually occur. Consequently, despite the intrinsic stochasticity of individual behavior, establishing the hidden communication networks in large self-organized groups facilitates a quantitative understanding of behavioral contagion. This paper is available via open access here. 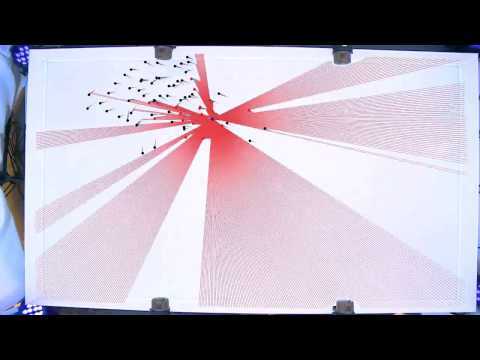 The videos below demonstrate our automated tracking, visual field reconstruction and visualization of social influence networks in groups.